Microsoft on Monday announced that its HoloLens Development Edition was available for preorder, with units set to ship to developers beginning March 30. The company early last year introduced the holographic computer technology as a feature for Windows 10. It later announced a partnership with Volvo that would allow the application to be applied to the automobile sales floor. Over the past year, Microsoft has unveiled partnerships with Autodesk Fusion 360, NASA, Case Western Reserve University and the Cleveland Clinic, highlighting vast real-world possibilities for its virtual reality technology. Other developer applicants will receive invitations to purchase the Microsoft HoloLens Development Edition. HoloLens is a fully untethered and self-contained system that enables holographic computing natively with no markers or external cameras. No phone or PC connections are needed. HoloLens Development Edition will include a clicker, a carrying case, a charger and cable, a microfiber cloth, nose pads, and an overhead strap. It will be available for developers in the United States and Canada for US$3,000. Developers who purchase HoloLens also will receive immediate access to hundreds of Universal Windows Platform apps via the Windows Store. The HoloLens Development Edition will offer developers access to a showcase of holographic app experiences to get started. Among the first of those apps is HoloStudio, which allows developers to create 3D in 3D at real-world scale, Microsoft said. The application integrates with OneDrive and can be exported to a 3D printer or Sketchfab. Another application, HoloTour, lets developers transport users to different locations and give them the experience of actually being there, the company said. The applications could be game changers for business developers — from retail to the travel sector and beyond. “Given the cost of this device, it is likely we’ll see the most interest initially for business applications,” said Rob Enderle, principal analyst at the Enderle Group. “The creation of this device was based on the need to explore Mars without having to send people to the planet, and it has a great deal of utility for remote viewing and virtual X-ray vision initially as a result,” he told TechNewsWorld. 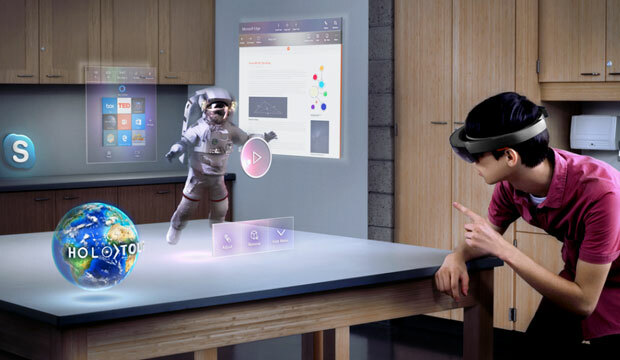 Microsoft highlighted three examples of how HoloLens Development Edition could be utilized in game development. Fragments is a crime drama experience, Young Conker is an action platform game, and RoboRaid in essence allows old-school 2D games such as Space Invaders to play out around the living room. None of the games is revolutionary in design, but it is still the early days of VR gaming. “When Windows 95 came out, people weren’t used to a graphical user interface, so to navigate that you had to learn how to use a mouse, which is very basic for us today,” said Joost van Dreunen, CEO at SuperData Research. “When Windows 95 was launched, it came with two games, includingMinesweeper and Solitaire, which showed how to use the interface,” he told TechNewsWorld. The dev kit for HoloLens is just $350 more than that of Oculus 2. Moreover, Microsoft is targeting a wider market of developers and highlighting its all-around potential for augmented reality, van Dreunen noted. That could be necessary given that VR remains an expensive proposition for gamers and thus has a limited market. “Its ability to mix the real and the virtual will eventually make it into a very unique gaming system, but costs will need to come down sharply, and that means initial volumes are likely to focus on business and government markets where this cost isn’t an impediment,” said Enderle. In the near term, virtual reality likely will be used in mundane and practical applications. “Repair technicians, robot drivers, technical schools, interior designers, space planners and telemedicine facilities will likely find this technology critical to their efforts long before we have the price drop we need for gaming,” said Enderle. “Law enforcement, security and the military will find this a low-cost and fascinating way to set up Hogan’s Alley-like simulations, and that will lead to some impressive first-person shooters using real buildings but simulated attackers,” he added.